The scale of the protest was unprecedented. The killing was not. Since Indonesia illegally invaded the former Portuguese colony in 1975, at least 200,000 people have been killed — one third of the population. While not the largest massacre in this genocidal history, the Santa Cruz massacre was witnessed and photographed by foreign journalists, inspiring a worldwide outcry which continues today. In fact, demonstrations against the occupation of East Timor will be held all over the world today, including here in the United States. Major protests are planned for Los Angeles, San Francisco, Houston, Washington, D.C., and New York. The protests come in the midst of a series of high-level engagements between the United States and Indonesia. President Clinton himself meets with Indonesian dictator Suharto next week and Defense Secretary William Cohen is off to Jakarta this week. And Washington has backed a $30 billion support package for the Indonesian economy in the wake of the collapse of the Indonesian currency earlier this year. Massacre: The Story of East Timor, a documentary produced by Amy Goodman and journalist Allan Nairn on the Santa Cruz massacre and the history of Indonesian and U.S. involvement in the Southeast Asian nation. AMY GOODMAN: Six years ago today, on November 12th, 1991, Indonesian troops armed with U.S. M16s fired on a crowd of several thousand unarmed East Timorese civilians gathered in the Santa Cruz cemetery in the capital of East Timor called Dili. More than 250 Timorese were killed. The scale of the protest was unprecedented. The killing was not. Since Indonesia illegally invaded East Timor 22 years ago, at least 200,000 people have been killed. Demonstrations will be held around the world today, including in the United States. Major protests are planned for Los Angeles, San Francisco, Houston, Washington, D.C., Chicago and New York. One interesting point to keep in mind as you listen to today’s documentary, there’s a showdown going on at the United Nations right now between the U.S. and Iraq, because the U.S. says Iraq has violated U.N. Security Council resolutions. Well, it’s not the only country to do that. The U.N. Security Council passed two resolutions against Indonesia for its illegal occupation of East Timor. The difference is, Indonesia is a close ally of the United States, and so it is not asking for those resolutions to be enforced. Instead, there’s a series of high-level meetings between the United States and Indonesia in the coming weeks. President Clinton himself meets with the Indonesian dictator Suharto next week in Vancouver. Defense Secretary William Cohen is on his way to Jakarta. And Washington has backed a $30 billion support package for the Indonesian economy in the wake of the fluctuations in Asian markets. Later on the show, we’ll speak to Congress Member Barney Frank of Massachusetts, who objects to the U.S. bailout. But right now, to the documentary, Massacre: The Story of East Timor. JOSÉ RAMOS-HORTA: I lost one sister and two brothers. EAST TIMORESE WOMAN: It was 10 days before I was to give birth. The army was shooting people, and they would die at our feet, but you couldn’t stop to help them. JOSÉ RAMOS-HORTA: I know families that were totally wiped out. EAST TIMORESE MAN: Two American newsmen badly beaten: Mr. Allan Nairn and Miss Amy Goodman. AMY GOODMAN: The Indonesian army converged in two places. ALLAN NAIRN: Hundreds and hundreds of troops coming straight at the Timorese. AMY GOODMAN: When they came, they opened fire on the people. PRESIDENT GEORGE H.W. BUSH: We pride ourselves, and I think properly so, in standing up for human rights. RICHARD BOUCHER: Military assistance programs expose the trainees to democratic ideas and humanitarian standards. PRESIDENT BILL CLINTON: I’m very concerned about what’s happened in East Timor. We have ignored it so far in ways that I think are unconscionable. AMY GOODMAN: Massacre: The Story of East Timor. I’m Amy Goodman. JAMES BAKER: Big countries with powerful military machines should not be permitted to invade, occupy and brutalize their peaceful neighbors. AMY GOODMAN: With these words, former Secretary of State James Baker explained why the United States was going to war against Iraq. Yet, 16 years earlier, another big country, Indonesia, invaded a much smaller one, East Timor, with the support of the United States. What followed was one of the greatest genocides of the 20th century. It is estimated that up to one-third of the Timorese population has been killed through a policy of army massacre and enforced starvation. Many of those who are left have been imprisoned and tortured by a military armed and trained by the United States. East Timor, a quiet farming nation on a mountainous island about 300 miles north of Australia, had been a Portuguese colony until 1974, when there was a democratic revolution in Portugal and the new government decided to disband its empire. Neighboring Indonesia, a military dictatorship more than 200 times East Timor’s size, began attacking Timor in an effort to prevent the island nation from completing its move toward independence. On December 7, 1975, Indonesia launched a full invasion. Timorese shortwave radio, monitored by reporters in Australia, was heard putting out desperate calls for help. TIMORESE SHORTWAVE RADIO: A lot of people are being killed—I repeat—indiscriminately. More than a thousand troops have been added. AMY GOODMAN: The night before the invasion, Secretary of State Henry Kissinger and President Ford were in the Indonesian capital of Jakarta, toasting General Suharto, the Indonesian ruler. PRESIDENT GERALD FORD: Our relationship involves a common concern for the right of every nation to pursue its destiny on its own independent and sovereign course. On behalf of Mrs. Ford and myself, I raise my glass and propose a toast. AMY GOODMAN: João Carrascalão, the brother of the former governor of East Timor and himself a political leader now in exile, was working for the Indonesians at the time. JOÃO CARRASCALÃO: I arrived at Jakarta one hour before President Ford and Henry Kissinger landed in Jakarta. And on the same night, I was informed by Colonel Suyanto—he was a top officer in the Jakarta administration—that America had given the green light for Indonesia to invade Timor. AMY GOODMAN: The United States, Suharto’s main backer, supplied 90 percent of Indonesia’s arms. The story of East Timor is a story few know about, except those who have lived through it. Six foreign journalists who were there as Indonesia attacked were executed by the Indonesian military. Australian TV correspondent Greg Shackleton sent this report the night before the frontier town where he was visiting was seized by the Indonesian troops. GREG SHACKLETON: Why, they ask, are the Indonesians invading us? Why, they ask, are the Australians not helping us? Who, they ask, will pay for the terrible damage to our homes? My main answer was that Australia would not send forces here. That’s impossible. However, I said, we could ask that Australia raise this fighting at the United Nations. That was possible. At that, the second in charge rose to his feet, exclaimed, “Camerado journalist!” shook my hand, the rest shook my hand, and we were applauded, because we are Australians. That’s all they want: for the United Nations to care about what is happening here. The emotion here last night was so strong that we, all three of us, felt we should be able to reach out into the warm night air and touch it. Greg Shackleton in an unnamed village, which we’ll remember forever, in Portuguese Timor. AMY GOODMAN: And it was to be a report Australians would remember. The following day, Indonesian troops moved in and executed Shackleton and his crew. Though the government of Australia ended up siding with Indonesia, the U.N. Security Council denounced the invasion of East Timor and passed two resolutions like those later passed against Iraq, calling on Indonesia to withdraw its troops without delay. But United States lobbying prevented any U.N. action, and as Indonesia began to execute the Timorese en masse, Washington doubled its military aid. I first arrived in East Timor in the summer of 1990. Almost 16 years after the Indonesian army first came to shore, they were still occupying East Timor. I was there with journalist Allan Nairn, a correspondent for The New Yorker magazine. ALLAN NAIRN: Dili, the capital city, was honeycombed with army bases and torture houses. There were soldiers on the street corners, secret police watching the market stalls and the public parks. Timorese could be hauled away to the torture houses if they were found speaking to foreign tourists or listening to foreign shortwave radio. There, people would be given electroshock, beaten with iron bars. And at night, soldiers wearing hoods would roam through the neighborhoods terrorizing the Timorese. AMY GOODMAN: We did not have to go far to learn the story of East Timor. When they thought the army wasn’t looking, people would approach us, speaking in their native tongue, Tetum, Portuguese or English. They were anxious to somehow get word to the outside world, but begged us to keep their names secret. We have disguised their voices. UNIDENTIFIED EAST TIMORESE MAN: Every village, they kill 10 people, sometimes 11, 12. They kill the people every day. My brother killed by the army. I saw them, myself, be killed in front of many people. And the army, they forbid all the people, “Don’t cry.” Brothers or sisters killed, but nobody cried. If cries, they shoot. AMY GOODMAN: Traveling in the countryside, we heard of how the army had driven people off their farms. As the Timorese fled, the army bombed and strafed them from low-flying Bronco planes and other aircraft provided to Indonesia by the Ford and Carter administrations. UNIDENTIFIED EAST TIMORESE WOMAN: [translated] It was 10 days before I was to give birth. The army was shooting people, and they would die at our feet. But you couldn’t stop to help them. Some were still alive. We just had to keep running. AMY GOODMAN: The Timorese were herded into prison and resettlement camps. In one rural village teeming with camouflaged troops, an older man told quietly of how the army had withheld food and how hunger still ravages the young. UNIDENTIFIED EAST TIMORESE MAN: [translated] Lack of nutrition for the children, all these consequences, children growing up not to normal in their intellectual capacity. So many people have been killed because they will be looking for food, so they have to get out of their village and are just killed outright. AMY GOODMAN: When we met with the army intelligence chief, Colonel Gatot Purwanto, he confirmed that the army had killed 200,000 East Timorese and that there was widespread hunger among the survivors. Journalist Allan Nairn and I returned to East Timor in order to be present for a historic event. A special delegation from the United Nations and Portugal was due to visit East Timor. The Timorese hoped the visit would finally lead to U.N. action and enforcement of the Security Council resolutions calling on Indonesia to withdraw from East Timor. AMY GOODMAN: But despite the threats and a dramatic increase in disappearances, torture and deaths, Timorese had prepared to speak out. They had met in secret, making banners and petitions for the delegation. When the army tried to hunt them down, many had gone into hiding and sought refuge inside churches. But under pressure from the United States, the visit of the delegation had been called off. Three days later, with the world’s spotlight removed, the army stormed the Motael, Dili’s main Catholic church, and killed a young man named Sebastião Gomes, who had taken refuge there. And then came the morning of November 12, the two-week commemoration of Sebastião’s funeral. A memorial mass and procession were planned to lay flowers on Sebastião’s grave. After the mass was held at the Motael, people, young and old, came out into the street, and in a land where public speech and assembly had been forbidden over a decade, they started chanting. The Timorese then held up banners drawn on bed sheets. They had been prepared for the delegation that never came. The banners called on Indonesia to leave East Timor and said things like “Why the Indonesian army shoot our church?” The Timorese were facing a gauntlet of troops that stretched the length of Dili. It was the boldest act of public protest occupied Timor had ever seen. ALLAN NAIRN: More and more Timorese joined the procession. They came from huts and schools and offices along the way. And there was this building feeling of exhilaration, as well as fear, among the Timorese. And when they reached the cemetery, the crowd had swelled to maybe 5,000 people. Some went inside to lay flowers on Sebastião’s grave. Most of the crowd was still outside. And then suddenly, someone looked up, and we saw that marching up along the same route that the Timorese had come came a long column of Indonesian troops, dressed in brown, holding M16s in front of them, marching in a very slow, deliberate fashion, hundreds and hundreds of troops, coming straight at the Timorese. AMY GOODMAN: Allan suggested we walk to the front of the crowd between the soldiers and the Timorese, because although we knew that the army had committed many massacres, we hoped that we, as a foreign journalists, could serve as a shield for the Timorese. Standing with headphones on and microphone and camera out in full view, we went and stood in the middle of the road, looking straight at the approaching troops. Behind us, the crowd was hushed as some Timorese tried to turn away, but they were hemmed in by cemetery walls. ALLAN NAIRN: The soldiers marched straight up to us. They never broke their stride. We were enveloped by the troops, and when they got a few yards past us, within a dozen yards of the Timorese, they raised their rifles to their shoulders all at once, and they opened fire. The Timorese, in an instant, were down, just torn apart by the bullets. The street was covered with bodies, covered with blood. And the soldiers just kept on coming. They poured in, one rank after another. They leaped over the bodies of those who were down. They were aiming and shooting people in the back. I could see their limbs being torn, their bodies exploding. There was blood spurting out into the air. The pop of the bullets, everywhere. And it was very organized, very systematic. The soldiers did not stop. They just kept on shooting until no one was left standing. AMY GOODMAN: A group of soldiers grabbed my microphone and threw me to the ground, kicking and punching me. At that point, Allan threw himself on top of me, protecting me from further injury. The soldiers then used their rifle butts like baseball bats, beating Allan until they fractured his skull. As we sat on the ground, Allan covered in blood, a group of soldiers lined up and pointed their M16s at our heads. They had stripped us of all of our equipment. We just kept shouting, “We’re from America!” In the end, they decided not to execute us. ALLAN NAIRN: The soldiers beat us, but we actually had received privileged treatment. We were still alive. They kept on firing into the Timorese. We were able to get onto a passing civilian truck, went into hiding, but the Timorese, who had been with us there on the cemetery road, most of them were dead. AMY GOODMAN: You’re listening to Pacifica Radio’s Democracy Now! We’ll be back in a minute. AMY GOODMAN: I’m Amy Goodman, and this is Pacifica Radio’s Democracy Now! special on Massacre: The Story of East Timor. PACIFICA REPORT: From Washington, this is the Pacifica report for Tuesday, November 12, 1991. A massacre in East Timor. Among those injured were two journalists, including a news editor of Pacifica station WBAI in New York. MONTAGE OF WORLD NEWS FOOTAGE: When Indonesian troops opened fire on a crowd—This is CBC Radio—The massacre of 100 unarmed Timorese by the Indonesian military—Photographs of the bloody massacre during a fight for freedom—This is the CBS Evening News. 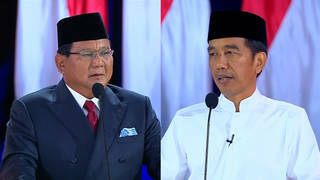 AMY GOODMAN: In the face of the massacre story, even Suharto’s longtime allies were compelled to condemn the killings and came under public pressure to cut back their aid to Indonesia. In Australia, large crowds marched on the capital and surrounded Indonesia’s local consulates. The European Parliament voted for sanctions against Indonesia, and the European community later canceled a scheduled trade pact. There were even open protests inside Indonesia where student demonstrators were beaten and arrested. Back in the United States, the Bush administration continued to ship weapons to Indonesia. PRESS SECRETARY: Ladies and gentlemen, the President of the United States. PRESIDENT GEORGE H.W. BUSH: A lot of discussion is going on on the tragedy in East Timor. We have expressed ourself in terms of the pure human rights part of it. We pride ourselves, and I think properly so, in standing up for human rights. AMY GOODMAN: Despite the fact that Indonesian officers who had received U.S. military aid in the past included those who planned the invasion of Timor and have overseen the policy of mass slaughter there, after the massacre the Bush administration actually fought to increase the aid to the Indonesian military. I had a chance to ask why at a public forum with Bush State Department official Larry Dinger. AMY GOODMAN: A third of the population has been killed, about 200,000 people. More than a hundred people, with U.S. weapons, were killed on November 12th. What would it take for the State Department to say, “We should cut off aid”? LARRY DINGER: What does it take to cut off aid? As I understand it, American law says that if a nation is classified as a gross violator of human rights, then aid should be restricted to basic human needs deliverance. The State Department, including the human rights bureau of the State Department, does not consider that Indonesia qualifies for that classification. It has never considered that, and it doesn’t today. AMY GOODMAN: But many Americans did not agree. After the massacre, a grassroots movement emerged quickly in the United States, spearheaded by a new group called the East Timor Action Network, or ETAN. Thousands called on Congress to cut off military training aid. In the fall of 1992, it did. Charlie Scheiner founded the network. CHARLES SCHEINER: After the Santa Cruz massacre in November 1991, it seemed like there was an opportunity to maybe change not only U.S. policy toward Indonesia and East Timor, but to change the Indonesian policy and get the Indonesian military out of East Timor, because there was a lot more public awareness and attention being paid to it than had been paid for about 15 years. So, I and some other people formed this grassroots organization in the U.S., the East Timor Action Network, as a way for people who felt the same way we did to put their awareness, put their energy, into some kind of pressure on the U.S. government and on the Indonesian government. AMY GOODMAN: In the fall of 1992, activists made East Timor an issue in the Wisconsin senatorial campaign between Bob Kasten, the Republican incumbent, and Russell Feingold, his Democratic challenger. SEN. RUSS FEINGOLD: My opponent, whom I defeated, Senator Kasten, was the leading proponent of providing the arms and continuing American military aid to Indonesia last year. And another Wisconsin congressman, Congressman Obey, led the fight to stop that aid. So I became aware of it during the campaign and was contacted by a number of people back in Wisconsin, who continue to contact me about the human rights violations. So it came from Wisconsin, but now it’s become very relevant to what I do as a member of the Foreign Relations Committee. AMY GOODMAN: Once in the Senate, Feingold became a leader on Timor policy. SEN. RUSS FEINGOLD: My feeling is, is that this is just the tip of the iceberg of places where in the past American foreign policy has done just the opposite of what American values would dictate. And it makes me want to get in there and root out this, what I consider to be borderline corruption of our foreign policy, and to find it in the East Timor situation and find it in other places, so that the United States—people of the United States are not paying for this kind of thing. AMY GOODMAN: Senator Feingold’s talk of corruption proved to be unwittingly prophetic. One year ago, after 21 years of being largely ignored by the corporate press, the issues of East Timor and Indonesia suddenly burst on the national scene. The Nobel Committee announced the 1996 Peace Prize would be awarded to two East Timorese: José Ramos-Horta and Bishop Belo. And in the U.S., the campaign finance scandal broke over contributions to the Democrats by the Riadys, Indonesian moguls who own the Lippo Bank, closely aligned with Suharto. Mochtar and his son James Riady and their Lippo Bank have been the focus of the Senate campaign finance abuse hearings. It’s since been reported that James Riady was the single-largest contributor to Clinton’s 1992 presidential campaign. Both Riadys remained in Indonesia and refused to testify at the hearings. In a scandal that’s still unfolding, James Riady was rewarded with dozens of White House meetings, at one point helping to broker a sit-down meeting between Suharto and President Clinton. But though the Indonesian billionaire had direct access to the Oval Office, Clinton has so far refused to meet with José Ramos-Horta. I questioned White House press spokesperson Mike McCurry about this. PRESS SECRETARY MIKE McCURRY: Yeah. PRESS SECRETARY MIKE McCURRY: I didn’t—I never said that many occasions that they talked policy. AMY GOODMAN: Talking a number of occasions. PRESS SECRETARY MIKE McCURRY: I never said on a number of occasions that they talked policy. AMY GOODMAN: Well, it’s come out, talking about—talking about policy sometimes. PRESS SECRETARY MIKE McCURRY: If you know that to be true. I don’t know that to be true. AMY GOODMAN: Well, by your own admission, James Riady has come to the White House. PRESS SECRETARY MIKE McCURRY: By the President’s own admission Friday, he knows James Riady and has known him for a long time and has seen him on a number of occasions. PRESS SECRETARY MIKE McCURRY: No. AMY GOODMAN: —or that those who have don’t want them here? PRESS SECRETARY MIKE McCURRY: They’ve been—Bishop Belo has been here at the White House, met with Tony Lake several times. AMY GOODMAN: Has not met with President Clinton, has not with President Clinton. PRESS SECRETARY MIKE McCURRY: Has he got any plans to be here anytime soon? AMY GOODMAN: José Ramos-Horta is here in Washington this week. PRESS SECRETARY MIKE McCURRY: Does Bishop Belo have any plans to be here? That’s what I asked. AMY GOODMAN: What about José Ramos-Horta, the other Nobel Peace Prize winner? PRESS SECRETARY MIKE McCURRY: I am not aware of any plans for the President to see him. Yes? AMY GOODMAN: He just won the Nobel Peace Prize. PRESS SECRETARY MIKE McCURRY: The President’s got a big schedule, and that’s not one of the items that’s on the schedule. AMY GOODMAN: And what does José Ramos-Horta think of the White House guest list and the Riadys’ financial connections to President Clinton? JOSÉ RAMOS-HORTA: I find it just extraordinary that an Indonesian businessman should be discussing with President Clinton the situation in East Timor. What [inaudible] Riady, close to the regime, has to do with discussing American politics towards East Timor? It is just beyond my comprehension. The Indonesian businessmen, they’re all very well connected with the military. Somehow, directly or indirectly, they are also responsible for the crimes of the regime in Indonesia and in East Timor. So I find it just bewildering that President Clinton should even allow him, this so-called Riady, to talk policy methods in terms of foreign policy, in terms of human rights, because certainly Riady was not briefing the President about the human rights situation in Indonesia on East Timor. He probably was urging the President to stop raising human rights concerns regarding East Timor. AMY GOODMAN: He has been invited to the White House. He has been to the White House dozens of times over the last few years. Have you gotten an invitation, as the 1996 Nobel Peace Prize winner, to meet with President Clinton? JOSÉ RAMOS-HORTA: No, I have not received an invitation. I hope that sometime in the near future we will be able to meet with President Clinton. I do not want the same honor of Mr. Riady. You know, I don’t want to compare myself with Mr. Riady. I’m a poor person. The money that I give—I get from the Nobel Peace Prize, I could not contribute also to the National Democratic Committee. If I could, if I had more, extra money, I might do that, but unfortunately, I have to apologize, we are too poor to contribute to anyone. And the money is going to a foundation, called Peace and Democracy Dom Martinho da Costa Lopes. That’s the former bishop of East Timor, to honor his memory and to do something, you know, that he always wanted to do, and that is to support the struggle for self-determination. AMY GOODMAN: There have been important changes in U.S. policy since the massacre, but they were all as a result of grassroots pressure, despite what President Clinton said in his first post-election news conference. PRESIDENT BILL CLINTON: Indeed, look at the difference in my policy and my predecessor’s policy. We changed our policy on arms sales, because of East Timor, not to sell small arms. And we co-sponsored the resolution in the United Nations in favor of greater human rights for East Timor. AMY GOODMAN: In reality, the Clinton administration fought both the arms sales cuts to Indonesia and the U.N. human rights resolution on East Timor, but was ultimately defeated by a tremendous grassroots lobbying campaign. While the moves were hailed by pro-democracy activists in East Timor, the U.S. continues to arm and back the Suharto regime, despite the tough rhetoric, like Vice President Gore’s just a few years ago. VICE PRESIDENT AL GORE: The essence of the injustice is starkly simple: unarmed, innocent people in their homeland have been killed and imprisoned and mistreated. It is an abuse of human rights. While the Riady money may have bought White House access and some favors, U.S. policy toward Jakarta has been far more influenced by U.S. firms. Hundreds of multinationals have close links with Suharto. Among them are some two dozen firms, including Morgan Stanley, Merrill Lynch, Motorola, Hughes Aircraft, that are actually formal business partners with the Suharto family. Suharto has opened up Indonesia’s oil and gas reserves to exploitation on favorable terms to firms like Texaco and Mobil, while letting out East Timor’s stolen offshore oil to Caltex and Phillips Petroleum. Freeport-McMoRan, with Henry Kissinger on its board, uses Indonesian troops to protect its gold mines in West Papua, Indonesia, and to repress indigenous Amungme people protesting spoilation of their lands. The regime’s other great resource is a vast supply of repressed labor. Independent unions are banned, and organizers disappeared and tortured. Last July, after an anti-Suharto riot shook Jakarta, the army launched a major crackdown, aiming to intimidate and kill the growing pro-democracy movement. Labor activist Muchtar Pakpahan was jailed and accused of subversion. This labor climate attracts companies like Nike and Reebok, which now do roughly a third of their sneaker production in Indonesia. Both firms are highly image-conscious. Reebok even gives human rights awards. Their next award ceremony is tomorrow. In 1992, they gave one to Fernando de Araújo, a young Timorese man jailed because he protested the Dili massacre. Present on the stage was Paul Fireman, Reebok’s CEO, who the year before had made more than $30 million—more than all of Indonesia’s sneaker-making workforce combined. Because Fernando was in jail, the Reebok Human Rights Foundation asked Allan Nairn and I if we would come to the award ceremony and describe the massacre that he was protesting. I described the massacre, and then Allan described who supports the military that committed it. ALLAN NAIRN: The U.S. has for years supported such repressive regimes, in large part on behalf of U.S. corporations. Inside Indonesia, the government suppresses independent unions, which allows companies to pay near-starvation wages. That helps Reebok, Nike and other make huge profits in Indonesia, paying the workers who make their shoes, many of them young women from the countryside, wages of about one dollar per day. Such companies have an obligation to, at the very least, call on Washington to stop shipping arms to the brutal Indonesian regime. AMY GOODMAN: Reebok wasn’t happy with our presentation. Since then, groups like the New Jersey-based Press for Change and the San Francisco human rights group Global Exchange have spearheaded successful campaigns to call attention to the exploitation of Indonesian workers, especially at Nike plants. With companies like these in their corner, the Suharto regime has, particularly since 1994, lobbied fiercely to offset the grassroots effort to reverse U.S. Timor policy and to resist Indonesian labor rights campaigns by U.S. unions. Meanwhile, Nobel laureate José Ramos-Horta continues to travel the world. He left East Timor at the age of 25, just before Indonesia invaded. He had been sent to the United Nations to plead East Timor’s case. While Ramos-Horta got out of East Timor alive, many members of his family did not. JOSÉ RAMOS-HORTA: I lost one sister and two brothers. The sister, she was 17 when she was killed, along with 20 other kids. Two Bronco aircraft nosedive over a village and blew up the school and the 20 kids there. One brother was killed when he was captured. Another, we don’t know what exactly happened, but he disappeared during a helicopter assault on my village, where he was. But like me, there are many, many other families, and in fact, some are even worse. I know families that were totally wiped out, families that I knew, I grew up with, that no longer exist. I know villages, when all my youth I spent there, and when I ask survivors, I’m told that village does no longer exist. It’s not on the map. So, this is the scale of the tragedy that was imposed on East Timor, with U.S.A. complicity. AMY GOODMAN: What gives you any hope? JOSÉ RAMOS-HORTA: Well, the past 17 years that I’ve been engaging in diplomatic struggle, I also have witnessed—and all of us witnessed—empires crumbling. No one thought possible five years ago, 10 years ago, that the Soviet Union would disintegrate into independent states, or Yugoslavia or the Berlin Wall, democratization in Africa and elsewhere. And Indonesia will follow the same. It cannot escape the train of democracy. But apart from that, the resistance in East Timor is continuing at all levels—armed resistance, one, but also cultural, religious. The entire people are mobilized. And we are very confident. I can state categorically, in the next three, five years, six years, maybe a bit longer, East Timor is going to be independent. AMY GOODMAN: Today, José Ramos-Horta is the external spokesperson for the Timorese underground. Its leader, Xanana Gusmão, was captured in 1992 after eluding the grasp of the Indonesian military for 17 years. Xanana had also led the remnants of the Timorese guerrilla resistance, fighting in the hills since the invasion. But perhaps his most important role has been as the political leader of the underground. Xanana was sentenced to life in prison after a trial Amnesty International denounced as a travesty of justice. After international outcry, he got 20 years. He’s called on President Clinton to reconsider the U.S. stance and to pressure Jakarta into a dialogue in search of an internationally acceptable solution. In captivity, Xanana remains a symbol of national resistance, a figure of Nelson Mandela-like stature among the surviving East Timorese. Speaking of the South African president, Mandela has offered to help the United Nations broker an agreement between Indonesia and Portugal, which the U.N. recognizes as East Timor’s administering power. Mandela met with Xanana this summer while visiting Indonesia and has since called for his release. Like Xanana, Mandela has called for Timorese partcipation in the talks that are ongoing at the United Nations, a petition Indonesia consistently refuses. This tape of Xanana Gusmão’s voice was smuggled out one year before his capture. XANANA GUSMÃO: [translated] We are not saddened with our pain. We open our eyes to the immense suffering of the 16 years. We are not afraid of blood. We think of the determination of our people. The struggle continues on every front. AMY GOODMAN: While it’s an open question what the future holds for the Timorese, the scale of the genocide is inescapable. Most Timorese have lost at least one member of their family. Many young children have lost both their parents. We visited one of East Timor’s many orphanages, which, like many of the Timorese who dare to speak out, must go unnamed. The children welcomed us with a song. TIMORESE ORPHANS: [translated] I laid awake at 4:00 a.m. I woke up, and I couldn’t find anybody. Mother and father, where are you? You left me all alone. AMY GOODMAN: Old women in traditional dress of East Timor, young men, young women, little kids, and they marched up to the cemetery. When we got to the cemetery, again there were thousands of people. The Indonesian army opened fire on the people.